Meticulously crafted, country-tinged whimsy is the realm of Clock Hands Strangle, a five-man band from “The Harbor City” of Melbourne, Florida. Their latest release, Redshift/Blueshift, is folk music in high definition, peppered with glockenspiels, trombones, harmonic whistle-breakdowns and the occasional Doors-flavored organ. In general, the band likes to start their songs off in a crouch, slowly gathering gumption and tension, before the inevitable pounce through a myriad of colorful instrumental flourishes. A perfect example is the first track on the album, “Redshift”, which builds from a ghostly acoustic strum into a stomping behemoth, complete with horns, before subsiding back into the skeletal beginning, with singer Todd Portnowitz ruminating on both Pangaea and the Cosmos, and how human beings are similar (metaphorically speaking). Portnowitz continues to drop nature-related metaphors and similes throughout the album, which, musically speaking, is like one massive, epic song (that deals with massive, epic subject matter). In general, most the tracks on the album run into each other, and that’s dandy fine, especially if you have the time to listen to it all the way through. Redshift/Blueshift is a proper “Album”, in that respect. Check out the North Mississippi Allstars as they headline the Six Degrees of Memphis SXSW 2008 Showcase! In the latest installment in our “Hello My Name Is..” series, BTR got a chance to check in with The Flying Machines, The Muggabears, and The Forms to find out the inspiration for their names. Read on to find out how your favorite BTR bands were named, including one name-change! Continue reading here to find out about The Muggabears and The Forms! BTR is absolutely thrilled to present a very special episode of BTR Live Studio. 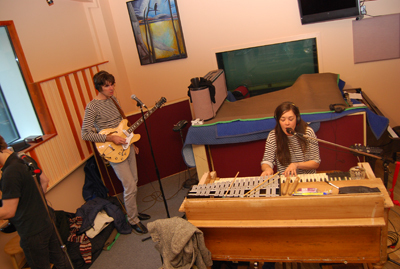 The Brunettes stopped by the studio all the way from New Zealand to record this exclusive live set. Featuring tracks from their newest release, Structure and Cosmetics, and some old favorites- don’t forget to check out the interview too! This is a session not to me missed! Listen here. 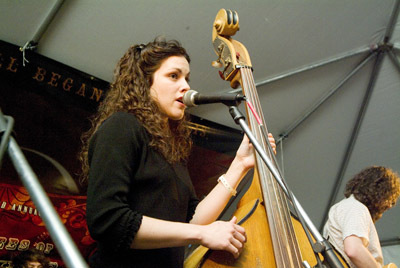 Amy Lavere live from the Six Degrees of Memphis showcase at SXSW! Check it out here ! Giant Panda Guerilla Dub Squad is in heavy rotation here on BreakThru Radio. They just completed a six week national tour in November (including ten west coast dates), and are set to play festivals like Bonnaroo, Mountain Jam, and Wakarusa. G.P.G.D.S. formed in Rochester, New York in 2001 and have been touring relentlessly ever since. 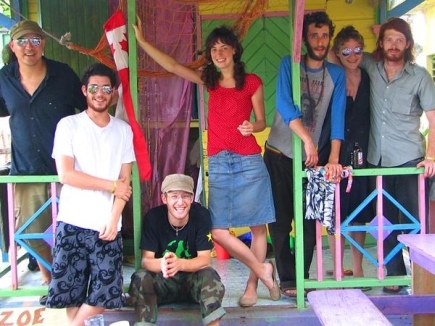 They combine every body-moving rhythm they can get their hands on including reggae, dub, and afrobeat. The group can get both introspective and let loose and just jam out. They have a feel that has “just the right mix of dark and light to keep you on your toes,” according to their press release. The band has opened for Toots And The Maytals, The Wailers, Lee Scratch Perry, Morgan Heritage, Yellowman, The Meditations, Mad Professor, and Edi Fitzroy. They’ve played with Brazilian Girls, Thievery Corporation, Umphrey’s McGee, John Brown’s Body, and String Cheese Incident. The band is comprised of seven members: Matthew O’Brian (Guitar, Vocals), Christopher O’Brian (Drums), James Searl (Bass, Vocals), Dylan Savage (Guitar, Vocals), Rachel Orke (Rhodes Piano, Melodica), Buddy Honeycutt (Percussion, Voc), Aaron Lipp (Hammond B3 Organ). BTR had a chat with Bass player James Searl and he filled us in on the band. BTR: For our listeners that don’t know about you, introduce yourself and the band. James: I play bass and sing with Giant Panda Guerilla Dub Squad. We play all original music inspired by roots reggae and dub music. We strive to let the music make the music and try to keep up. It is influenced as well by the present day, the people around us, and our wish to provide health through music. BTR: How did you all get started in music? James: We all seemed to spring out of the earth wanting to have nothing to do with anything else. We have all been singers for our whole lives and have been influenced by each other for over a decade now. BTR: Where did your name come from? James: The name was inspired by a few factors. Being music makers, we deal with sounds. We hold no claim to being experts in naming and felt a bit pressured to have to come up with a name that properly suited our sound. We are all big fans of the novelist Tom Robbins. His first novel is titled “Another Roadside Attraction”. In this book there is a band described as a family unit that is traversing the California highways dosing people with the best sounds in the land. They were called Giant Panda Gypsy Blues Band. We enjoyed telling people that we were the Giant Panda Guerilla Dub Squad, in the spirit of the famed but fictitious band in the novel. It seemed to take up a whole marquee and was the biggest name in any of the papers. As the years have gone by, it has grown on us to offer a fourth dimension of perspective to who we are. Each word individually seems to conjure up different thoughts. It reflects internationalism, endangerment, animal ancestry, anti establishment, the art of Dub, grassroots pushing and unity among others. It is a name for the ADD generation to latch onto and play with. We encourage different versions of the name in some what of a five word matrix of assorted possibilities. Dub Panda Guerilla Giant Squad is fine by us. BTR: Does Rochester, NY have a supportive music scene? James: Huge! We would be nowhere without it. People in Rochester won’t support just any thrown together music. They have to really like it. When they do, they show it and are some of the most supportive people we have met anywhere. It makes us very proud to be from where we are from. Not to mention, there are generations of bands in Rochester that have been influencing each other for years and years. The longer you stick around, the more you get to be a part of. The city has a strong reggae history since the seventies. Friends and mentors of ours used to play in a band with Lee Scratch Perry in 1981 called Bahama Mama. We grew up hearing stories about Scratch throwing fits on Monroe Ave and living through the coldest winter of the century. Bands like the Buddahood, the Rype Band, Brothers Green, and any project singer Frank Bohm has been a part of have been huge influences in our community and we give thanks for that. Tony Cavagnero of the Buddahood is a guitar player who recently passed away. He taught most of us a lot about music and being in a band and why its worth it to work very very hard sometimes for little gain other than what your spirit feels. He was in just about every band we ever listened to locally and we miss him very much.